Ok, so I was surfing to the internet tonight, just visiting all my favourite blogs, websites and forums. I came across this image and it reminded me of my youth. When I was little I loved it when it snowed outside and we would be all cozy inside watching Christmas shows/movies on TV. Tonight we are sitting here, all cozy inside with the Christmas lights on and it is snowing like crazy outside.....guess what we are watching? Yes, we just finished watching some family Christmas movie. I just love it. So this got me thinking about all the favourite shows I used to watch when I was a kid. 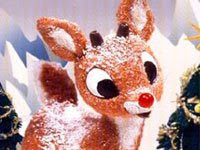 Year after year I tuned in to watch Roudolph. We would have our bath and be in our jammies with a snack so we could tune in at 8pm to watch Roudolph fly Santa's sleigh in the fog to deliver presents all over the world. Immediately following Roudolph was Frosty the Snowman. 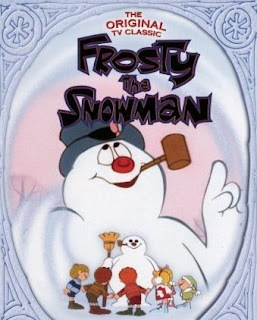 I remember sobbing at the end of this show when Frosty melted into just a puddle of water. As I matured I wasn't quite as dramatic and managed to get through this 1/2 hour classic without shedding tears. 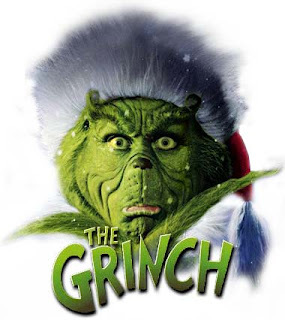 The Grinch was another one of my favourites. 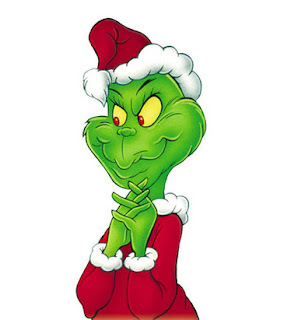 I always loved how little Cindy Lou Who got the Grinch to see the magic of Christmas. 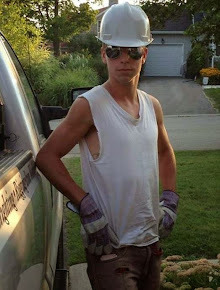 Once I was all grown up and had a family of my own, the traditions continued. My 3 kids also love these three classics. I loved sitting with them, watching these shows year after year. Now that they are a little older, we tune in to watch different Christmas classics. Amanda seems to be the one that enjoys this the most (like mother, like daughter). 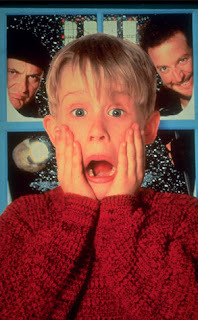 Home Alone is one of our favourites. She also loves to watch the Hallmark channel because they seem to have some really good family shows. We watched one the other night where a family had lost the spirit of Christmas and Santa's daughter, Christine, made it her mission to show it to them again. It was kind of corny, but cute. My favourite year was when they released the 'real life' version of The Grinch. On December 23rd we packed up the family and headed off to the movies to watch it on the big screen. I thought it was amazing. My youngest son Matt, who was about 3 or 4 at the time, was terrified of the Grinch and ended up sitting on my knee for half of the movie. It was still a fun filled night and we are happy to say that we own the DVD and watch it every year. The final one I want to share is The Santa Clause starring Tim Allen. I really love this one. Tim Allen is the father to this adorable little boy and he actually turns into Santa. It is just a very heartwarming story with a bit of humor too. Hopefully you have some family favourites that you like to watch year after year. I thank the person who posted the cute little reindeer icon on the forum and allowed me this trip down memory lane. It was fun to share it with everyone. I think I will go and surf the channels on the TV to see what is on. Knocking them down.......one pin at a time! Saturday was my youngest sister's birthday and she wanted to go bowling. After dinner we headed over to the Frederick Bowling Lanes to knock over a few pins with my family. My sister and her boyfriend Kevin, my mom and dad, my other sister Tracy and her daughter Payton, Amanda, Jason, Matt and myself made up the team! (my hubby was unable to attend due to his knee issues. We encouraged him to come along, but he decided to stay home and watch the Leaf game on TV). So when we first arrived we all decided on which ball we wanted. I went with a 10lb orange one, Jason had a hard time finding one that would fit his fingers, so he decided to share mine and Matt had and 8lb blue one. The first photos I took were of the balls in the rack......they look good, eh? Payton, who is only 7, wanted to take some photos with my camera and she got this shot of me just before my first turn. Not bad for a little person. This is a photo of Matt in action. He was struggling a bit, but he still enjoyed himself. You will notice he is also using my lucky 10lb orange ball. And here is Jason. He probably had the most fun out of everyone in attendance. It didn't matter if the ball when in the gutter or he got a strike, he was happy. Funny enough, he lives his life the same way. 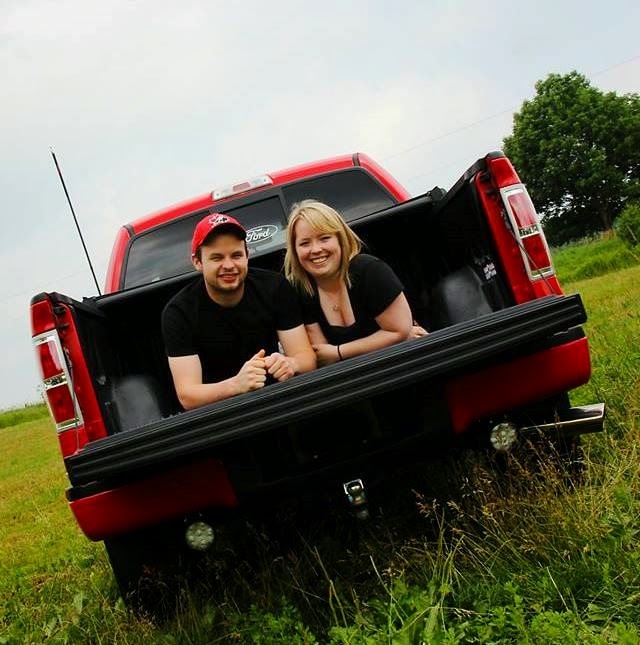 Lucky guy! Because there was a large group of us, we were always fighting for a seat when it wasn't our turn. Jason took my mom's seat when she went up to bowl and when she returned she made him give it up, so he just sat on her lap. That doesn't happen too often, so I was sure to grab a photo. Later in the evening Matt was sitting on her knee as well, but I didn't have my camera handy, so I missed it. Amanda was coming down with a cold and didn't actually bowl. She was present, but I didn't seem to get any good shots of her. Oh well, maybe next time. Happy 30th birthday Marie! I hope you had a great time. was so much fun. I am not going to post photos of the retreat because you can see them on the blog and on the photo gallery (soon). Before all the craziness of the retreat started, Joanne, Amanda and I went down to the beach to see if there was a sunset. I can't say that I have ever been to a beach in November. It was a perfect day. The water was so still and the sun was setting behind some far away clouds. It wasn't the same as it is in the summer, but still beautiful. Amanda always writes her name in the sand. It didn't matter that it was the beginning of November and that we were the only people to be seen. I couldn't resist snapping a photo of her! Here is the photo of the sunset. There is a small lighthouse off in the distance and the water was barely moving. This is me trying to be a photographer. Not too bad eh! The leaves on the trees all turn colour in the fall, even on the beach!